Hubert Jackson, born in 1943 in Culpeper, Virginia knew he wanted to be an artist since the age of six. Beginning with a correspondence course during high school, Jackson went on to formally study painting, ceramics, printmaking, sculpture and photography. Jackson earned his Bachelors in Fine Arts Education at Virginia State University in 1965. 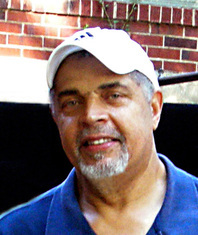 After graduation, he moved to Washington D.C. By 1971 he earned his Master’s degree in painting from Howard University. There he studied with James Porter, Lois Jones, Ed Love, Jeff Donaldson, and Starmanda Bullock. Beginning in 1965 he visited local museums and studied major works in D.C.’s National Gallery of Art, Corcoran Museum, Phillips Collection, and smaller galleries. He viewed the works of Gene Davis, Morris Louis, Paul Jenkins, Lucille Roberts (Malkia) and Sam Gilliam. All of these contemporary artists had a great influence on Jackson’s aesthetic. In the early ‘70s, he participated in the historical national movement of community based mural projects under the advisement of Hughie Lee-Smith. Jackson traveled to Europe. In Amsterdam he visited the Rijksmuseum which has a large collection of Dutch painters, especially focused on Rembrandt’s work. Jackson wanted to see exactly how Rembrandt used light. He visited Paris and saw the famous sculpture of Henry Moore. At the Louvre he was mostly impressed by the large collection of Egyptian artifacts and statuary. At the Centre Pompidou he saw the modern French painters’ work up close. Jackson traveled across Switzerland, England, and Belgium soaking up the culture. During his last trip to Europe in 1977, Jackson journeyed through Spain to The Prado Museum in Madrid. There, the young artist was able to study the collections of Francisco Goya and El Greco who, greatly influenced Jackson’s vertical painting style. In 1999 Jackson retired from 34 years of teaching art in the Washington, D.C. public school system, including 27 years at Woodrow Wilson High School. Jackson so inspired his students that several of them became art professionals themselves.1999 was the year that Jackson also left D.C. to settle in Colonial Beach, Virginia. The natural beauty of the Northern Neck area further inspires his work. He also continued his passion for learning, and in early 2004 he attended the Corcoran School of Art. There he studied under noted artists William Christenberry and Steven Cushner. Jackson has exhibited extensively. His work is in a number of private collections, not only in the U.S., but also outside the U.S. These include ambassadors of foreign countries such as Lesotho, Ghana, Guinea and New Guinea, through the Artist in Embassies program. He is co-founder of the Wider River Gallery in Colonial Beach, Virginia.